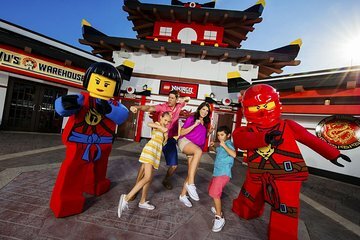 Experience LEGOLAND California with admission and transport from Los Angeles, and discover roller coasters, mini cities, and family-friendly rides. Avoid the hassle of driving and parking near the theme park; simply meet a convenient, air-conditioned vehicle at your L.A. hotel or the TCL Chinese Theatre and spend your whole day exploring. Travel to the Land of Adventure and Fun Town, meet the knights and damsels on Castle Hill, then create your own LEGO world in the Imagination Zone before returning to Los Angeles.